Happy Weekend to all of you, my friends! I know that it's been pretty quiet around here lately. I'm happy to be back today with a fun new layout to share! I have a new Printable Journal Kit from Ephemera's Vintage Garden to work with this month. It is another really gorgeous kit called Love Is Chic. It is absolutely jam-packed with goodness, and suited to so many different occasions! On June 1st will be my daughter's 1st anniversary. I made this layout in honour of that occasion. My daughter and her husband won't see it until I share it on facebook on June 1st. I also wanted to play along with the Challenge going on over at Our Daily Bread. They're having a fun F-L-O-W-E-R Word challenge. Aren't all those bits and pieces pretty? All the papers...other than the white background...are from the kit! 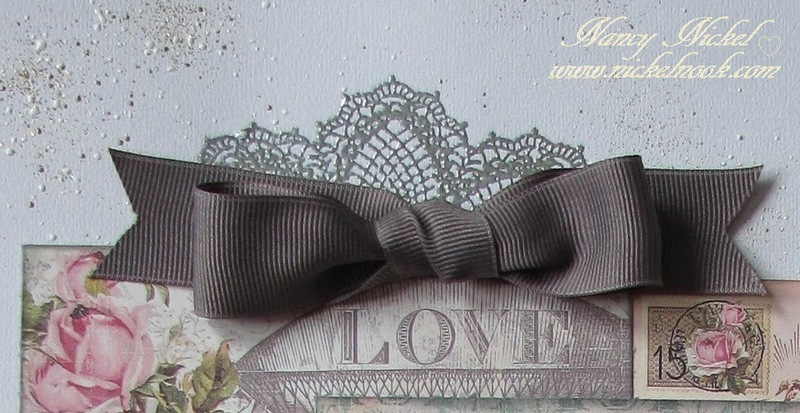 Below is a closer look at the Frantage, silver embossing, pretty bow, and the detail of the printables. Stamp: Stampin' Up - Hello, Doily! I'll be back soon to share a mini album using this kit! and pick up the Love Is Chic kit. I know you'll have lots of fun with it! Oh, and don't forget to go to Debbie's blog HERE to sign up for her newsletter. Beautiful layout and couple! Great picture of them! Oh, Nancy, what a beautiful gift for your daughter and her husband! They are going to LOVE it! Such beautiful, delicate details and a lovely photo of them...sigh! So glad you joined us this week for the ODBD Shining the Light challenge! Hugs! Nancy, this is a gorgeous layout. I especially love the embossed doilies. I'm sure your daughter will be more than impressed! A gorgeous way to show off that lovely picture! Nancy, I love this page. Beautiful work my friend. Can't believe that year has passed so quickly Nancy ! Your daughter will be thrilled with your layout, such a beautiful photo and your beautiful papers and embellishments. The doily stamp is fabulous ! What a treasure! 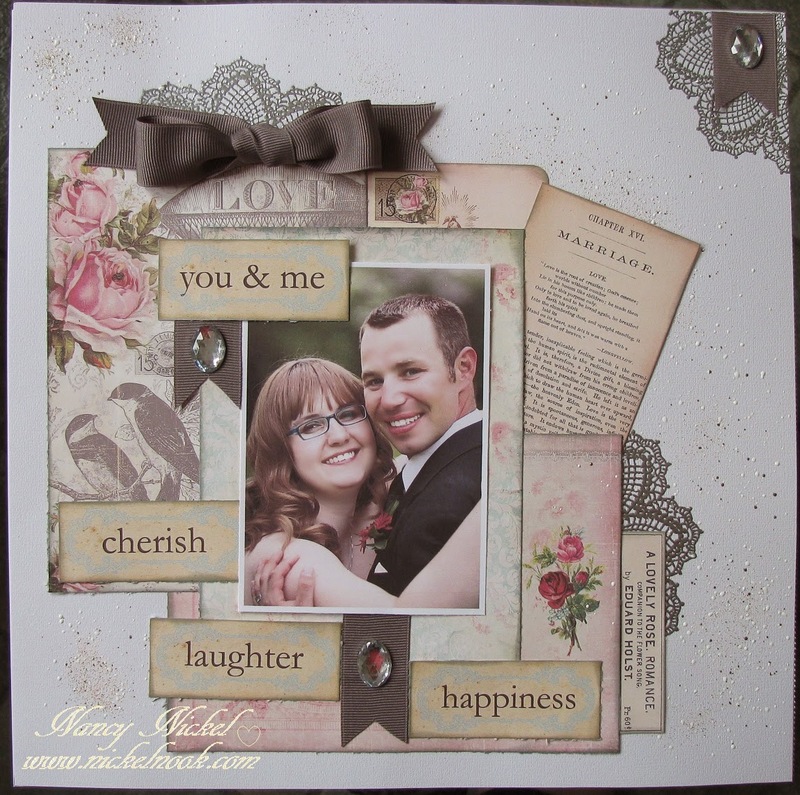 I just love your layout with the doily accents and the gorgeous papers. Wonderful way to frame this sweet couple! This is beautiful Nancy, just gorgeous and your daughter and SIL are going to be thrilled! So beautiful Nance. The picture itself is beautiful, but you have dressed it so prettily in those EVG pieces. A treasure for sure! Hugs!